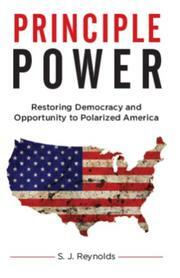 A debut book provides a plan to overcome rampant partisanship and political gridlock in the United States. As the recent presidential election showed, the U.S. citizenry remains historically pessimistic about national politics and hungry for radical reform. The economy chronically underperforms, disenfranchising a once secure middle class; stalemates perennially stymie Congress; and ideological polarization narrows public discourse. In his work, Reynolds asserts that this impasse is mostly the result of widespread political dysfunction, the solution of which is a matter of huge urgency: “The challenge of deadlocked partisan politics is an existential threat to our nation, and will lead to national decline if we cannot rectify it successfully.” In response to this crisis, the author recommends three major sets of reform. First, he proposes a constitutional amendment that would end the era of anonymous and unlimited political donations, which keeps public discussions captured in a web of hyper-partisan special interests. Next, he argues for an electoral reform act that would, among other things, halt the politically motivated gerrymandering of congressional districts, limit senatorial filibusters, and impose mandatory voting. Finally, the author backs the creation of bipartisan commissions to streamline the policymaking process, infusing government bureaucracy with greater efficiency. Each of these suggestions is built around two fundamental tenets: the Power Principle promotes the constitutionally mandated aggrandizement of national authority over time consistent with an efficient and adaptable government that represents the popular will. The Pragmatic Efficiency Principle demands that a real investment be made to effect such an increase in national control with the aim of generating equal economic opportunity and political representation for all. Reynolds’ discussion is sober and ideologically unencumbered—his call for a collective rejuvenation of bipartisanship admirably practices what he preaches. (Political polarization ultimately paralyzes “the nation’s ability to adapt to events at home and abroad, much less lead them,” he notes.) In addition, despite a general tone of exigency, this is a fundamentally optimistic book that avoids the shrill alarmism of so many prophets of inevitable decline. But the principles the author presents are quite vague, so much so that it’s not always entirely clear how the two are fully distinct. Furthermore, most of the actions he advocates cover familiar ground, and he never articulates a precise political route to their enactment. A cleareyed diagnosis of America’s central political problems that lacks specific remedies.